In the continuing acts of violence, 11 more people were killed including two advocates in the provincial metropolis in separate incidents and target killings here on Friday. According to details, two advocates were shot dead near FTC Bridge Sharah-i- Faisal Road within the limits of Brigade police station. The incident took place near FTC bridge where Advocate Muhammad Saleem Bhatti and Advocate Faheem Riaz were going on a car bearing registration No Z-9053, when unidentified armed men opened indiscriminate firing on them. As a result both received bullets on their faces and died on the spot. The car also knocked down a cyclist namely Nouman. After getting the information, heavy contingents of police rushed to the spot and shifted the bodies to Jinnah Postgraduate Medical Centre (JPMC) for autopsy. The doctors said they received bullets on their faces. SHO Akhtar Abbas said police recovered empty shells of 9 MM pistol from the spot. President of Karachi Bar Association Muhammad Aqeel Advocate condemned the killings and said that KBA will boycott courts on Saturday (today) and will make a strategy for further action. Police said victims were members of PML-N Lawyers Forum and Saleem Bhatti was the Vice President of the forum. Police officials said both victims were going home after meeting their friend Khalil while Advocate Faheem was going to drop Saleem Bhatti to his home, but when they reached near FTC bridge unidentified armed men targeted them. Faheem was the resident of Liaquat Square Malir, while Saleem Bhatti was the resident of Sheikh Arcade Tariq Road. No case was registered till filing of this report. Meanwhile, an activist of Sunni Tehreek was shot dead in Rozi Goth in the limits of Sarjani police station. The victim 40-year-old Zahid Qadri was the resident of Rozi Goth Sarjani Town.He was sitting outside his home when unidentified armed men targeted him. The body was shifted to JPMC for legal formalities. Tension gripped surrounding areas of Sarjani town after news of ST worker’s killing spread. Two people were injured during clash between two religious groups in New Karachi as heavy contingents of police and Rangers were deployed in sensitive areas. In separate incidents, three people were gunned down when unidentified armed men attacked two teashops located near Sindhi hotel, in New Karachi Industrial Area police limits. In the first incident, armed motorcyclists targeted New Quetta Hotel, resulting in killing of owner Saeed Jummah, 35, and his employee Ikhlaq, 20. Shortly after this incident, armed men also attacked another hotel named Quetta Bismillah Hotel located in a few distance, as a result one 28-year-old Subhan was killed. SHO Muhammad Rashid said all three victims were Pakhtun and hailed from Quetta and killed in the ongoing spate of target killings. Tension engulfed the surrounding areas of New Karachi including, Godhra Society, Nullah Stop, Sindhi hotel and others as all shops and market were closed down due to uncertain condition of locality. A local businessman was gunned down while his female housemaid was injured when armed men attacked his car near Nagan Chowrangi in the limits of Sir Syed Police Station. DSP Altaf Hussain said deceased Anwar Islam, 40, was resident of Peoples Chowrangi area, adding, that he accompanied by his female housemaid Fatima, 12, who was also wounded in the incident and her mother was going somewhere when the vehicle was attacked. The officer said it seemed the incident occurred over personal enmity. Separately in Frere police limits, one 30-year-old Faheemul Haq alias Moon, was gunned down near Punjab Colony. Police said the deceased lived in Gizri and had criminal record. He was recently released from jail. Elsewhere, three bodies were found from separate parts of the City. One Imran, 27, son of Muhammad Khan was found dead from Khajji ground in Rizvia police limits. His hands and legs were tied with rope and also shot twice. Police said deceased was a resident of Pak Colony and worked as a salesman in local shopping Mall and had also torture marks on his body. Police official said the victim was missing from Thursday night and early hours of Friday police found his body from Khajji ground where unidentified culprits threw his body. The body was shifted to Abbasi Shaheed Hospital for legal formalities and later handed over to the heirs. Two bullet-riddled and torture marks bodies of the two young men were found from Kalakot and Orangi Town. The identities of victims yet to be ascertained and in both the incidents culprits kidnapped them from unknown places and then threw their bodies and ran away. Law-enforcement agencies have detained and released nearly 70 suspected persons during overnight search operations in parts of metropolis. The search operations were launched against the volatile law and order in parts of City. The areas came under search operation included Old Sabzi Mandi, PIB Colony, Essa Nagri, Madina Colony, Orangi Town, Qasba Colony, Bukhari Colony, Gulfam abad, Kati Pahari and Aligarh Colony. Co-ordination Committee of Muttahida Quami Movement (MQM) has strongly condemned the murder of noted lawyer Mumtaz Bukhari Advocate and termed the dreadful incident as an attempt to destroy peace of the city. The committee said that the enemies of peace were doggedly after the peace of the city and the murder of Mumtaz Bukhari Advocate is also a vicious attempt to create sectarian tension in the city. The Co-ordination Committee extended its condolences to the bereaved family members of Mumtaz Bukhari Advocate and expressed sympathy and solidarity with the millat-e-jafriah. The committee demanded of the government to take notice of the killing of Mumtaz Bukhari Advocate and said that the killers should be arrested immediately. The committee also prayed for the eternal peace of the departed soul. The committee also appealed to millat-e-jafriah to defeat the wicked conspiracy to create disturbance in the city by showing patience and forbearance. The legal fraternity boycotted court proceedings on a second consecutive day on Wednesday against what they said was the illegal establishment of offices of NGOs in prisons. 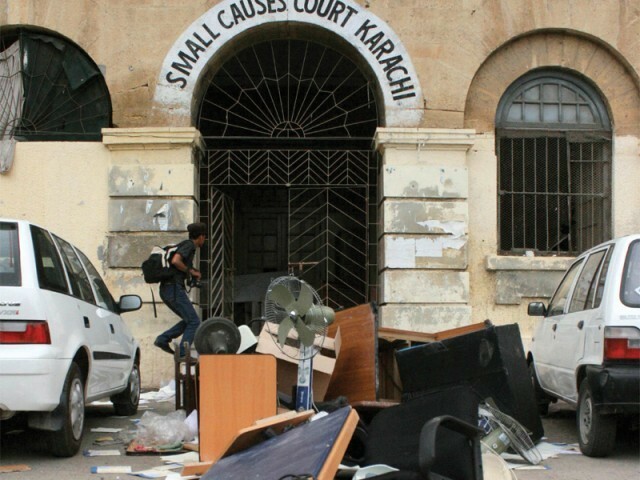 The Karachi Bar Association ahs threatened to boycott legal proceedings unless the offices of NGOs are removed from jail premises within one week. “The boycott is part of the protest lodged by the KBA on Tuesday and will continue till our demands our accepted”, KBA General Secretary confirmed this while talking to The News. Work at the city courts remained suspended and the lawyers did not attend proceedings. The judges remained in their chambers as even under-trial prisoners were also not brought in from the Central Prison. There was a complete shutdown and the offices of stamp vendors and oath-commissioners were also closed, while he court premises wore a deserted look. On Tuesday, the two offices of NGOs situated within the courts premises were removed by lawyers, which was also intimated to District and Sessions Judge (South) Hasan Feroze. The offices were removed after the orders were passed onto both President KBA Mohammed Aqil and General Secretary Haider Imam Rizvi by Justice Maqbool Baqar on the phone, the KBA general secretary said. The KBA has also chalked out a plan to stage a protest inside the jail if the NGOs’ offices situated within its premises are not removed. However, inside sources disclosed that pressures had been exerted both on the judiciary and bar members to give up their demands for the removal of the NGO offices at both the city courts and jail premises. When this correspondent contacted the KBA general secretary, he denied any move on the part of the chief justice of the Sindh High Court to rescind the order regarding the removal of the NGOs’ offices from the jail premises, stating that some elements were trying to sabotage the situation.